In Kaniyo Pabidi, six groups have been habituated. In May, June, July and August visitors have over a 90% chance of seeing the chimps. In February, March, April and September this drops to 70%, and in October, November, December and January, when food is scarcer, chances drop to 50%. For chimp tracking its best to start early around 7.00 am. 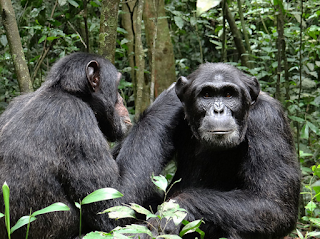 The 2 days itinerary for Chimpanzee Tracking Tour in Budongo Forest, Kaniyo Pabidi - A perfect two day Mini-Safari from Kampala if you want to see Chimpanzees in the abundance Wild and have limited time. We depart Kampala at 7 am and arrive near 11 am Budongo Eco Lodge where you check in at either in the dormitory or self contained room for the day. This is a most delightful area of Murchison Falls National Park. Budongo Forest is an oasis of tranquility where one can truly feel at one with nature. This is the oldest Mahogany Tree Forest in East Africa - and steps have been taken to preserve this most wonderful forest with its tall and majestic trees. The Forest has been under constant threat by loggers out to make a few shillings instead of looking to the future and preserving this magnificent forest for future generations. Budongo Forest will seem like an oasis to you, the quiet being broken by the sounds of birds, primates nearby - very different from a forest in North America or Europe. Certainly a place to come and spend a couple of days in peace with creation. Get settled into your quarters and have lunch at the Budongo Eco Lodge included in the safari price: After lunch take a guided forest walk and discover the beauty of this awesome place yourself. • Guided Forest Walk of 1 1/2 hours in length can easily be done. Day 2: Breakfast in Budongo Forest - Chimpanzee Tracking a three to four hour small group experience visiting some of the habituated Chimpanzees of Budongo Forest- spending an hour with them and observing them. Each day, chimpanzees like gorillas move to another location for the night building new nests for that day. Budongo Forest is a project of both the Jane Goodall Institute and Uganda Wildlife Authority. Enjoy your time with the chimpanzees. Lunch at Budongo Eco Lodge. Depart for Kampala and return in the late afternoon. 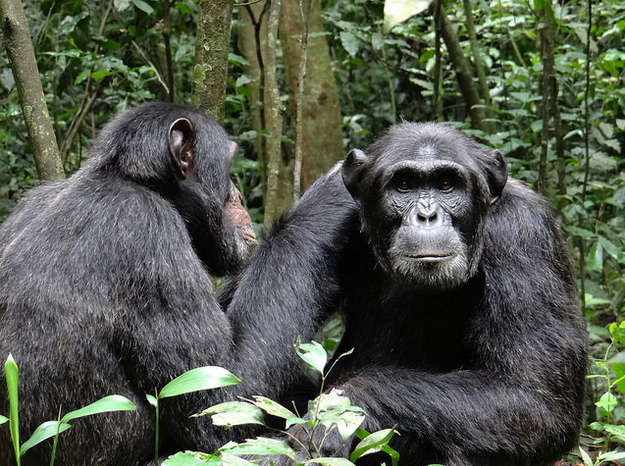 Tour Price For 2 Days Budongo Chimps Tracking (These prices are just suggestive and may be lower or higher than the suggested.